The Hotel de Paris is located in the heart of Montpellier on a little pedestrian street in the city centre. It is opposite the Place de la Comedie and the SNCF train station. 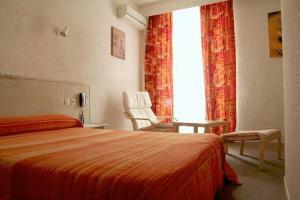 Rooms are comfortable, spacious and include a telephone, TV and private bathroom. Breakfast is served each morning. Hotel de Paris is centrally positioned near a variety of restaurants, cinemas and shops. The Olympic Swimming Pool is just a few minutes away.